2 million. That’s the number of apps you have to compete with on the App Store. The Google Play Store? 2.8 million. Not only are there wildly popular apps dominating the app stores, but new competitors are being introduced every day. That’s why I was really excited to speak with Dr. Pablo Penny, the ASO Lead at Phiture. With a wealth of experience working with the biggest app brands in the world, Pablo knows exactly what it takes to attract and convert users on the app stores using App Store Optimization (ASO). Meet Dr. Pablo Penny, ASO Lead at Phiture. Pablo: I’m the App Store Optimization (ASO) lead at Phiture (pronounced feature) and we’re a mobile growth consultancy working with top apps all around the world. We work with apps such as Headspace, Skyscanner, and over 40 other apps. What we do is helping clients with, for instance, App Store Optimization. So essentially driving installs for apps through the various app stores. Not only do we try to increase their visibility in the stores by making sure they rank very high for different keywords but we improve their conversions because ultimately what you want to do with ASO is to drive installs, you want to convert the users. I focus on the ASO part of Phiture, but we also work on user retention with apps where we are optimizing for push notifications, getting results from your CRM and lifecycle marketing, campaign ideation, and more. 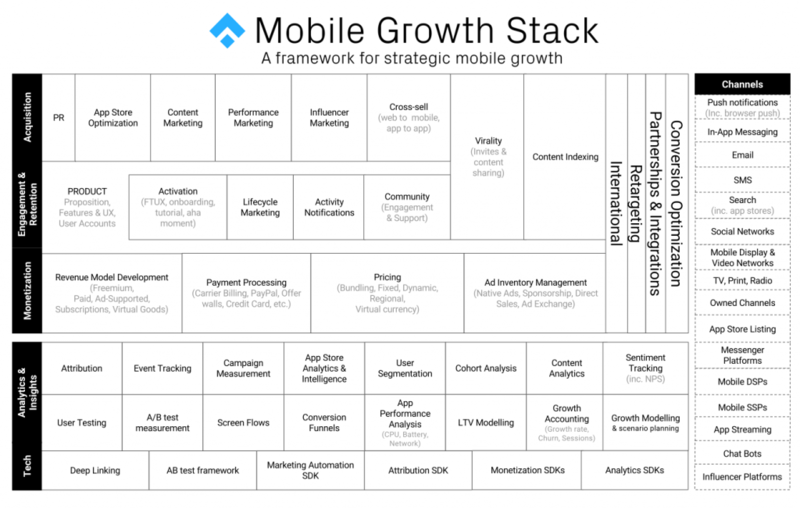 You may be aware of our model – the mobile growth stack. It’s pretty well known in the industry and we also have a blog called mobilegrowthstack.com. And this model actually shows all the different aspects and all different topics for which you can drive growth. It actually includes three different levels: acquisition, retention, and monetization. Pablo: I’d say App Store optimization (ASO) is basically driving installs to apps in both the Apple App Store and Google Play, but also on other stores like Amazon’s store and other third party stores out there. [ASO] is anything you can do in terms of driving organic installs for your apps and developing a strategy for growing your mobile product just within the store. I think the main difference to SEO is that it’s also quite creative, it’s a lot about visuals. It’s not just about ranking really high for important keywords. That is a big part, getting your app in front of a lot of people, so making sure you do get high rankings for your top keywords – the keywords people would insert in the stores when they’re looking for your app. But ultimately you want to convince people to also download your app. Conversion optimization is anything you can do to optimize visual assets and that includes for instance your icon in the Google Play store, your featured graphic, and screenshots on both platforms. But also your short description because your short description is actually also indexed by Google. It’s important to have the right keywords in there and you can test and see if version b versus the current version actually converts better. ASO is about increasing visibility like SEO, but also increasing conversions with copy and visuals. How are apps ranked in the App Store? First of all, it’s quite different in the App Store and the Google play store. So in the App Store, the keywords that are indexed are in your title, in your subtitle, and your keyword set, even though your keyword set is not visible to users, they’re indexed by Apple. And the keywords you put in your title and subtitle actually get higher weight than anything you put in your keyword set. So Apple indexes you for those keywords. Obviously if you don’t have enough installs then you’ll never really rank very high for these keywords anyway. Except if you do some blackhat tactics like maybe buying keyword installs. So you do need people to actually download your app to also rank higher for these keywords. So it goes both ways to get higher rankings, and that’s why ASO is way more than just keyword optimization. Because to rank high for these keywords you need to drive installs. That means anything you can do to get featured in a store, and anything can do to be in the right category and rank high in the categories, will help visitors to find you better. But also optimizing your store assets so people coming through and say you have a music app, people coming in using a music keyword actually download your app then you’ll actually go up in the rankings for that particular keyword. That’s how it works on the App Store. Is ASO More Important than CPI (Cost per install)? I think you need to have a strategy around paid acquisition as well was as organic. The benefits of ASO are that it can be, depending on what you’re doing, a fairly cheap way of acquiring new users in the stores. Also important, is that organic users retain the best and they have the highest retention rates. They’re not incentivized and maybe even tricked into downloading an app. So I think it’s a good mixture but that also depends on the apps — some apps just really focus on organics but I think it’s good to have a mixture. Do you approach ASO differently for paid apps vs free apps? I mean, of course it’s more difficult to do app store optimization for a paid app. That’s not something you can really optimize that much for, it just says paid. And users are just less likely to install it. So I guess you need to really double down on your ASO efforts to actually get those installs. I think what you could do is think about what kind of benefits you can push, individual assets or claims you make that actually get people to say “okay yea it’s paid but it might be worth it”. A lot of people come in [to the App Store] with the intention of actually installing the app and that depends on your brand. We’ve worked with apps that have big brand names and people already come with the intention of installing the app. But with less well known apps it’s actually it’s actually a lot harder so their conversion rates and installs are often way lower. How do you choose keywords for ASO? So actually if you go into the ASOstack.com which is our blog with a lot of topics around keyword optimization but also conversion optimization and the ASO stack. Which is like a framework showing all the different assets to target and how to do it. There’s an article around the keyword optimization cycle which is something we developed at Phiture. The keyword optimization cycle is actually split up in four different phases. We call the first phase the research phase where you want to get a big backlog of keywords. You want to find those keywords and bring them into the app listing. If you’re not set up with a keyword tool there’s a lot of really useful keyword tools out there that allow you to create this large backlog and allow you to look at – what the odds are of ranking for that keyword. There’s tools like AppTweak, MobileAction, The Tool, ASO Desk, and a lot of other tools out there that make this process a lot easier. A really simple method actually is to use Google’s keyword planner tool in Adwords, where you can just put in, say, the keyword: music. And you’ll get loads of examples of searches around similar keywords. Importantly, those will actually be keywords from web searches. Still it’s useful for having them backlogged but importantly always keep in mind people search entirely differently in the store than they would on web. The second phase would be to prioritize that backlog. Keyword tools are actually really useful here because you want to upload all of these keywords you find, which might be a few hundred, into that keyword tool and it will give you prioritization scores of how much a search term is actually searched for let’s say in the US on iOS. Apple actually gives you this score which is called search popularity score. In the U.S. App Store you have search ads, which is showing ads for certain keyword searches. For the people who run search ads for their app, Apple provides an indication of how many people search for a keyword. So the more people search for a keyword, The higher the cost is and the higher the bid you have to place. So those tools are really useful for generic keyword research because it allows you to look at the keyword – music has such a search popularity of say 70 whereas best music artists maybe is only ten. So you want to really target the high volume ones. But importantly, you want to see how high the competition for each keyword is. Which apps are actually ranking for it and do you have a chance of actually ranking high for it, if you’re not ranking in the top 10 in the app store, it’s actually like you’re not ranking at all. Make sure if you have a smaller app that you target those niche keywords, you’re never going to [rank for] a really high volume keyword. So it’s not about just targeting the very popular ones but the popular ones you can actually rank for and those that are relevant to your app. Then you go and insert the best one in your title, to the long description on google play, and then importantly track them. Again, keyword tools allow you to actually have a look at, you know, I’ve moved up ranks for this keyword, haven’t moved at all for this keyword, or have gone down for another. That’s where iTunes Connect comes in, you want to look at a metric called app units by search. There’s also app units from browse,Apple breaks the total app units up into different source types. You want to see, do the app units from search actually go up for your app. This last phase is all about monitoring and tracking organic growth. If you deployed an app today, what would be the first thing you do? The first thing if I’ve already optimized for the keywords and that’s sort of in order and I have good titles, good keywords. The first thing I’d do, I think if it’s a great product I would actually pitch to Apple and Google to get featured. If you get featured in the beginning that will really give you a great kickstart. And if it’s a good app, or something interesting, there’s a good chance that Apple will actually do that. You can pitch to Apple and Google, you just put together a pitch deck explaining why your app should be featured. That’s the ideal scenario, like you get a feature, that drives installs, and automatically lifts you up and gets you off the ground. Shane: Thanks for reading our interview with Pablo and I hope you’ve been able to learn as much from him as I have. Our goal with this blog is to bring you actionable advice around every aspect of web and mobile development from design, to development, and through growing your user base. If you’re interested in more stories like this one, be sure to subscribe to our Newsletter to receive weekly updates with only our very best content.